Join us for World Helicopter Day on August 20th, 2017 from 10a-1p for a FREE simulator lesson, FREE lunch and other fun filled FREE events! For Heather, this day is a chance to share her love of helicopters with the general public as well as an opportunity to inspire others to follow their interest in aviation into a career as a pilot. Attendees will be able to explore a range of helicopters, take a helicopter flight simulator ride, participate in a preflight contest and attend a pinch hitter seminar. 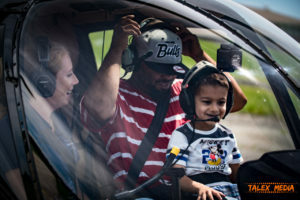 Entry to Independent Helicopters hanger is free of charge and open to all ages. Lunch will be available and there will be several presentations on how helicopters fly and the types of careers that are available in the helicopter industry. A limited number of local area joyflights will be available for a fee on the day for those that want to take to the air. Doors open at 10am and the event runs until 1pm.